Peak concurrency dropped 460 users, a decrease of 0.78%. Minimum concurrency grew 317 users, a increase of 0.96%. Median concurrency grew 51 users, a increase of 0.11%. Peak concurrency dropped 332 users, a decrease of 0.56%. Minimum concurrency grew 286 users, a increase of 0.87%. Median concurrency grew 551 users, a increase of 1.22%. Peak concurrency dropped 1,900 users, a decrease of 3.09%. Minimum concurrency grew 168 users, a increase of 0.50%. Median concurrency dropped 993 users, a decrease of 2.14%. A new Sunday a new record. Peak concurrency grew 896 users, a increase of 1.41%. Minimum concurrency dropped 454 users, a decrease of 1.30%. 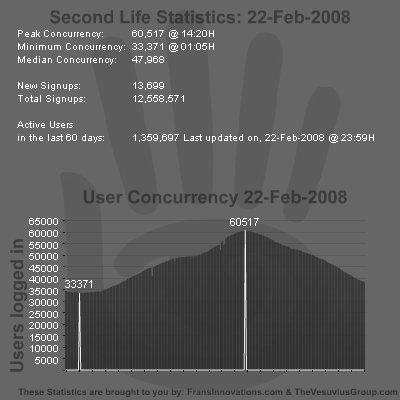 Median concurrency dropped 253 users, a decrease of 0.53%. First time that we peak over 60 thousand users on a Friday. Peak concurrency grew 2,222 users, a increase of 3.81%. Minimum concurrency grew 693 users, a increase of 2.12%. 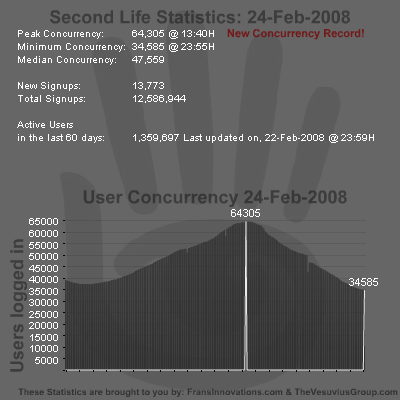 Median concurrency grew 3,034 users, a increase of 6.75%. Not surprisingly, keeping with the current trend, 59,187 is a new Thursday peak concurrency record. Peak concurrency grew 2,382 users, a increase of 4.19%. Minimum concurrency grew 1,526 users, a increase of 4.83%. Median concurrency grew 1,473 users, a increase of 3.35%. This is a peak concurrency record for Wednesdays. Peak concurrency grew 1,906 users, a increase of 3.35%. Minimum concurrency grew 2,172 users, a increase of 7.01%. Median concurrency grew 1,954 users, a increase of 4.53%. As reported on the Second Life blog, during 5:20pm and 5:45pm PST the concurrency reporting services where updated which caused a drop in the concurrency numbers, but not to the actual online residents. Edit: This was a Tuesday concurrency record as well. Peak concurrency grew 2,454 users, a increase of 4.31%. Minimum concurrency grew 2,261 users, a increase of 7.40%. Median concurrency dropped 269 users, a decrease of 0.59%. There where several issues last week which affected the concurrency services, a big chunk of stats during the daily low weren’t retrievable. This skewed last weeks median upwards, this explains that Yesterday the minimum and peak concurrency both were considerable higher and the median slightly lower then last week. This Monday’s peak is a record for Monday, once more it shoots above 60k. This is still relatively rare, Sundays and Mondays are the only days that have peaked above the 60 thousand users. Peak concurrency grew 2,840 users, a Increase of 4.84%. Minimum concurrency grew 124 users, a increase of 0.37%. Median concurrency grew 1,408 users, a increase of 3.13%. As you can see, again a new peak concurrency record. Peak concurrency grew 214 users, a increase of 0.34%. Minimum concurrency grew 457 users, a increase of 1.32%. 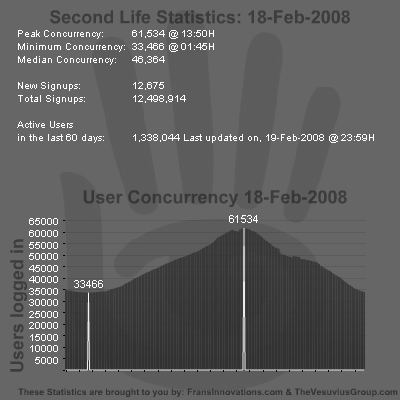 Median concurrency grew 368 users, a increase of 0.78%.